When Tomalak was a teenager his parents were killed when the Klingons attacked the Romulan colony on Dewa in 2346. He was rescued by the Intrepid and adopted by the Rozhenkos. Two years later he entered Starfleet Academy. As the first Romulan in Starfleet Academy life was not easy for Tomalak but he managed to excel in his studies. After graduating from the Academy he was assigned to the USS Ghandi. He was transferred to the USS Kearsarge five years later to be the Chief Operations Officer. He jumped at the opportunity to serve on the Galaxy class USS Enterprise-D which was launching in 2364 under Captain Picard. After the death of Commander Riker he was named First Officer and promoted to Commander and a lil over two years later he assumed command of the Enterprise after Captain Jellico was kidnapped by the Borg and subsequently died. He was forced to slide with the Prometheus in 2372 and was then placed in command of the Intrepid class USS Gallant. Tomalak had zero interest in becoming an Admiral turning down promotions half a dozen times the seven years since he took command of the Gallant. 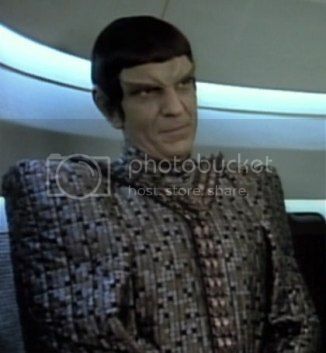 Peace between the Federation and Romulans was very important to Tomalak and after the Shinzon incident with the Praetor ready to talk peace Tomalak accepted a post to be the Liaison between the Romulans and the Federation ship assigned to the area.